Israeli occupation forces (IOF) fired two artillery shells at Juhr Al-Deek area in central Gaza Strip on Monday night. Local sources said that the two shells exploded in the amidst of citizens’ homes, but no casualties were inflicted. The Hebrew radio had claimed earlier that a rocket was fired from Gaza Strip at the western Negev. The broadcast said that the rocket was fired Monday night and exploded in an open area in Sha’ar HaNegev without inflicting any casualties or damages. The Hamas Movement said it would remain adherent to its resistance approach and following the path of martyrs whatever the sacrifices until all national goals have been achieved. 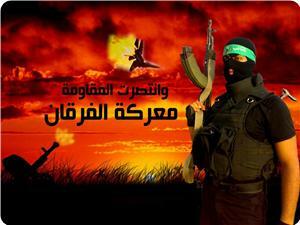 This came in a press release issued by Hamas on Sunday on the fifth anniversary of Al-Furqan battle. 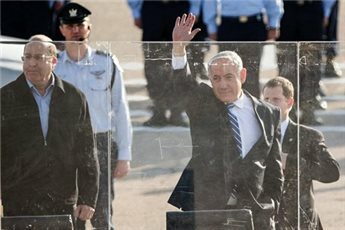 The Movement reiterated its rejection of the peace negotiations with the Israeli occupation state and stressed that the Palestinian people did not give anyone a mandate to negotiate the occupation on their behalf, and thus they are not bound by any agreement between the Palestinian Authority and the occupation. "[During Al-Furqan battle], the Israeli enemy wanted to break the will of the resistance spearheaded by Hamas, but our steadfast people responded, 'We will not leave our land or forsake the resistance whatever the sacrifices,'" Hamas stated. 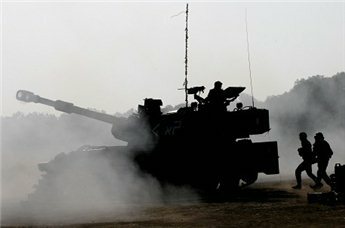 "Al-Furqan battle has become the legend of the era after the occupation withdrew from the environs of Gaza dragging tails of their defeat and failure behind them, and proved that the strong will of our people is tougher than all its tanks, warplanes and internationally banned weapons," Hamas added. Hamas also highlighted that the stifling blockade on Gaza would never succeed in eliminating the resistance in the field or isolating it politically. "Hamas along with the resistance forces will continue to be capable of springing surprises in the face of those besieging the Palestinian people, and will prove, as days go by, that it is deeply rooted in the hearts of its people and nation and that its enemies are too weak to succeed in breaking the Movement or force it to retreat from the path of resistance and liberation," the Hamas Movement underlined. Abu Obeida, spokesman for Hamas' armed wing Al-Qassam Brigades, warned of resistance's reaction over the continued tightened siege on Gaza Strip. In an exclusive interview with the Palestinian information center (PIC) reporter, Abu Obeida warned of explosion in case the unfair siege continues on the people of Gaza, threatening those who were involved in tightening the siege on Gaza, spearheaded by the Israeli occupation. The spokesman pointed out that Al-Qassam brigades have been put on full alert and are prepared to deal with any Israeli military aggression. Palestinian resistance has its own strategy in dealing with any Israeli escalation, he said, stressing that Israeli occupation could never predict its reaction. A projectile fired from the Gaza Strip landed in the Hof Ashkelon regional council area of southern Israel early Thursday, the Israeli army reported. An army spokeswoman said a siren went off overnight and in the morning a search team found the remains of a rocket. There were no reports of injury or damage. The Palestinian resistance on Thursday evening launched a rocket counterattack on the coastal city of Ashkelon in the 1948 occupied land in retaliation to Israel's recent air raids, which killed a child and wounded several others. Hebrew media sources said the rocket was fired from the Gaza Strip and exploded in an open field in the regional council of Ashkelon. The sources said the anti-missile system called the Iron Dome failed to intercept the Palestinian rocket. Consequently, Israeli code red sirens sounded throughout Ashkelon, a few moments later a large explosion was heard south of the city. The rocket attack caused no casualties or material damage, according to the Hebrew media. This was the second Palestinian rocket which falls on an Israeli occupied area after a similar one landed in an empty field on Thursday. Different Israeli media outlets said there are growing fears of escalation on the Gaza front, adding that more Iron Dome batteries were deployed in several locations in areas adjacent to Gaza, especially in Ashkelon, Ashdod, Beersheba and Sderot. 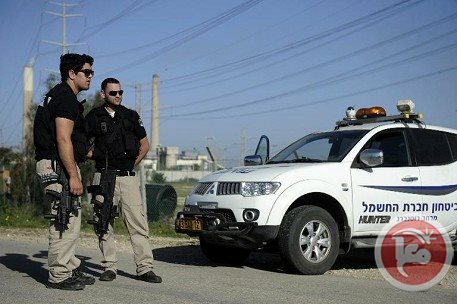 An Israeli engineer was seriously wounded by a Palestinian sharpshooter, as he was near the Nahal Oz military base, east of the Gaza Strip, Israeli military sources gave reported. The army said that the sources of fire came from the Gaza Strip, and that the Israeli man was airlifted to the Soroka Israeli medical center, in a serious condition after suffering a chest injury. The army added that it seems the sharpshooter “targeted workers conducting maintenance work on the security fence with Gaza as the fence was partially damaged due to the recent snow storm”. It also stated that its reserve “its right to retaliate to the attack”, and will act to protect its soldiers and civilians. Dozens of soldiers and military vehicles started a large search campaign in the area, while several Israeli military helicopters and F16 war jets have been seen flying over the area, and different parts of the Gaza Strip. On Tuesday at dawn, soldiers invaded a Palestinian community in the Jordan Valley, and demolished one home and four sheds. On Monday evening, a Palestinian civilian was serious injured by Israeli army fire close to the border fence in northern Gaza. On Monday at night and on Tuesday at dawn, soldiers invaded various Palestinian communities in different parts of the occupied West Bank, and kidnapped twelve Palestinians. A rocket fired from the Hamas-ruled Gaza Strip in the early hours of Monday hit a southern Israel community without causing damage or injuries, Israeli police said. Bomb disposal experts found the "rocket fired from the Gaza Strip" in a community near the city of Ashkelon, according to police spokesman Micky Rosenfeld. Police said the projectile hit near a school bus stop. Gaza government spokeswoman Isra Almodallal told Ma'an that Hamas had not confirmed or denied involvement in the incident. On Sunday, Egyptian security officials told Ma'an that Hamas had fired rockets as part of training that took place throughout the day in Gaza. Some of the rockets fell in Egyptian territorial waters, the officials said. Over the weekend, Israeli troops shot dead a Palestinian and wounded four others after the army said Palestinians fired a mortar that hit southern Israel, threw stones, and attempted to breach the border. In a separate incident, a Gazan was wounded by Israeli gunfire after approaching the security fence along the frontier. Prior to Friday, the last deadly incident in Gaza was on Nov. 1, when four Hamas militants were killed and five Israeli soldiers wounded during an army operation to destroy a tunnel from Gaza into Israel. Israel and the Islamist movement Hamas, which rules the southern Palestinian enclave, are committed to an Egyptian-brokered truce that ended a major eight-day confrontation in November 2012. 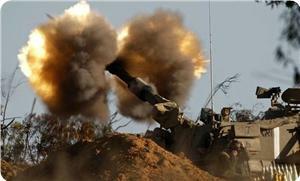 Israeli tanks fired several shells at Palestinian farmers in the northern Gaza Strip Saturday, witnesses said. Locals told Ma'an that farmers fled their fields east of Beit Hanoun after hearing the shelling. Member of Hamas's political bureau Mousa Abu Marzouk said that the Israeli occupation state would pay dearly if its army dared to attack the Gaza Strip, affirming that the Palestinian resistance is well prepared to defend its people. "Any new Zionist adventure will never be like its predecessors and Israel's leaders will regret it," Abu Marzouk warned on his facebook page on Friday. He expressed his belief that Israel's arrogance and delusions of grandeur would not stand in the face of the divine providence that protects the Palestinian people and their resistance. Abu Marzouk's remarks were in response to what had been published a few days ago by Maariv newspaper about Israeli military drills simulating a reinvasion of the Gaza Strip in addition to war threats made recently by senior army leaders. "Such talk is not new and attacking others is part of their nature that does not need any justification to the public opinion and the international community," he underlined. The Hamas official affirmed that the resistance fighters in Gaza take such Israeli threats seriously and they are doing their utmost to raise their efficiency and capability to face the enemy more masterfully despite the tight blockade and the smear campaigns by the besieging parties. In a rabid effort to justify the cold- blooded murder of three Palestinians in the southern West Bank on Tuesday, Israel has been spreading all sorts of lies about an imagined Salafist threat facing the illegitimate Israeli state. One Israeli army spokesman had the audacity to say that Israel had the right to murder Palestinians even if it had the faintest suspicion that these Palestinians would attack Israel targets. In other words, Israel grants herself the right to act as policeman, accuser, judge and executioner at the same time. This is the ultimate form of hubris and arrogance of power. Needless to say, this will invite an inevitable boomerang effect sooner or later because Palestinians will not cower away, however immense the sacrifices may be. For the Palestinians, cowering away would mean the beginning of the end for the Palestinian people. It implies inevitable extinction. Indeed, had Palestinians contemplated "surrendering" to Israeli Nazism, their very survival as a nation would have been shattered to smithereens a long time ago? Hence, Israelis are advised to keep their expectations modest because we are staying put in our ancestral homeland no matter how many Palestinians Israel murders. In fact, it is safe to say that every drop of Palestinian blood that is spilled at the hands of these nefarious Zionists will further consolidate our roots in this land. As to the issue of Salafists, it is highly likely that Israel is trying to create a bogyman in order to justify the killing of more Palestinians. In the final analysis, all Muslims are Salafists as the term implies following the example of the Prophets Muhammed and his companions. Clearly, Israel hopes that by demonizing Palestinians by calling them "Salafists", Israel will win the propaganda war and win any acolytes in the West. However, this won't help Israel, a country that has been trying to wipe off an oppressed people from the face of the earth in order to create a Judeo-Nazi empire through the acquisition of territories and lebensraum at the expense of its neighbors. There is no doubt that the latest act of murder near the town of Yatta has nothing to do with any real threat, especially one that would justify the execution of innocent people who have done nothing wrong. The only plausible conclusion is that Israel wants to spill the blood of our young men in order to boost the morale of its people, especially following its gigantic diplomatic failure to foil or stop the recently-concluded nuclear agreement between Iran and western countries. Israel may also be thinking of re-enforcing its deterrent vis-à-vis the Palestinians, especially in the aftermath of the killing of a number of Israeli soldiers by suspected Palestinian snipers in the West Bank of late. None the less, there is little doubt that the latest Israeli crime near Yatta will boomerang on Israel and that Palestinian fighters, Salafists and non-Salafists, will take part in the upcoming wave of resistance. 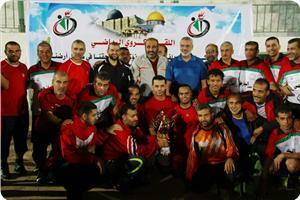 Palestinians can not really give up or terminate their resistance for a simple reason. The resistance is an "effect" and the Israeli aggression is the "cause" and since one can not remove the effect without first removing the cause, hence the resistance will continue. 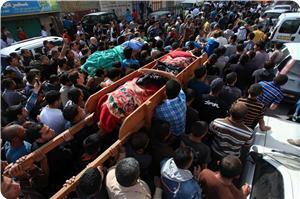 Finally, Israel by committing the blatant murder near Yatta, has actually committed a dangerous miscalculation. 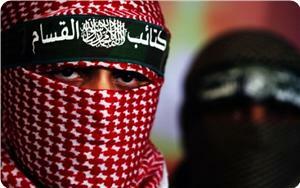 Now, every religiously committed Muslim all over the world will consider himself in a state of war with Israel. A Palestinian resistance fighter, from the Qassam Brigades the military wing of Hamas, was killed and four others were injured at dawn Tuesday in an accidental explosion in Gaza. Dr. Ashraf al-Quidra, spokesman for the Ministry of Health in Gaza, said the citizen Mohammed Ibrahim Bahloul, aged 34, died shortly after he was evacuated to Shifa Hospital in Gaza City, from wounds he sustained in an explosion in Tal al-Islam neighborhood in Gaza. Local sources told PIC's correspondent that Bahloul is one of the Qassam Brigades fighters, and that four other fighters sustained minor to moderate wounds and are receiving treatment in Shifa Hospital. Shallah: The resistance's decision to hit Tel Aviv in 2012 was "historic"
Secretary-general of Islamic Jihad movement Abdullah Shallah said that the Palestinian resistance's decision to strike Tel Aviv during the eight-day war (the battle of Ḥijarat Sajil) in 2012 was "historic" in every sense of the word. 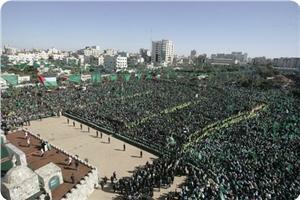 Shallah made his remarks during a ceremony held in Gaza on the first anniversary of the eight-day war. He talked in his speech about the strategic value of the 2012 war and its place in the history of the Palestinian-Israeli conflict. The Islamic Jihad official also called for necessarily building a national project based on the resistance option and not monopolizing the Palestinian decision-making. "No party or group of the Palestinian people has the right to impose a solution containing a waiver of our people's rights like the rights of return, resistance, travel and movement in every area of this land," he stated. He also stressed the need for adopting the resistance option as a program for all political forces and restoring the stature of the Palestinian cause at the Arab and Islamic levels. The official also criticized the Palestinian parties that wager on the peace negotiations with the Israeli occupation, affirming that such wager cannot be better than the resistance option. Senior Hamas official and lawmaker Mushir Al-Masri said that his Movement's resistance fighters work day and night to surprise the Israeli occupation and strengthen their steadfastness and fortitude. Masri made his remarks during a ceremony organized on Monday by the Islamic student bloc at the faculty of science and technology in Khan Younis. He affirmed that Hamas sees the truce with the Israeli occupation as an opportunity to prepare itself below and above ground to confront any coming Israeli aggression against Gaza. "The next battle will not be like 'Ḥijarat Sajil,' but we will fight them under the ground and reach their posts and fortresses," the Hamas official emphasized. "The resistance project stands on the cusp of victory, and all manmade crises and the political conspiracy against the Palestinian people only bring us closer to the moment of the true dawn," he added. The Palestinian Prime Minister in Gaza Ismail Haneyya stressed the Palestinian people and his government's adherence to the option of resistance until liberating the land, despite the risks and challenges faced by the Arab and Islamic nation. The Prime Minister's statements came during his participation in a football game between the team of former players and the team representing the Ministry of Youth and Sports. It was organized by the ministry on Wednesday evening in Gaza City, within the events of the anniversary of the Balfour Declaration. Haneyya pointed out that the events were not limited to this football match which was preceded by political, media and popular events, and stressed all Palestinians' adherence to the right of return. He said that one hundred years have passed since the Balfour Declaration, but the Palestinian people have become more determined to liberate their land, to restore their holy sites and the Aqsa Mosque and to achieve the right of return. 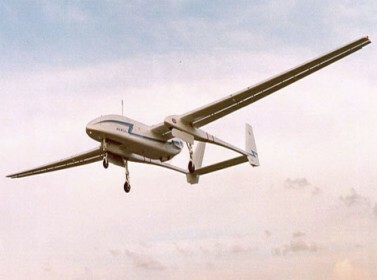 Palestinian fighters in the Gaza Strip declared, Sunday November 3, 2013, that it managed to down an Israeli drone flying over the northern part of the Gaza Strip. The fighters managed to control the drone and downed it in an open area in northern Gaza, while Israeli sources admitted that the drone did not drop due to a technical error. 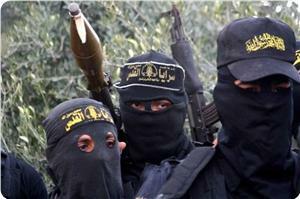 The Al-Qassam Brigades, the armed wing of Hamas, said its fighters managed to down the drone. This is the second time armed groups in Gaza manage to down an Israeli drone, as the Al-Qassam Brigades declared during the latest Israeli war on Gaza, a year ago, that it managed to down an Israeli drone, and documented the incident. An Israeli military spokesperson stated Sunday that the drone fell inside the Gaza Strip, effectively falling in the hands of the resistance. He said that the drone landed and crashed due to a “malfunction”, an issue that the resistance challenged. In related news, Israeli sources said that Israeli Defense Minister, Moshe Yaalon, and a number of senior military leaders, survived a possible attack by Palestinian fighters as the official toured in the border tunnel that was uncovered by the army a month ago, leading to a settlement across the border. The sources said that, despite the fact that the army said it defused the explosives in the tunnel, a bomb was still active, but did not explode. Yaalon and the army commanders visited the tunnel on October 29, and two days later, the bomb exploded as soldiers of the corps of engineers were inspecting the tunnel, leading to five injuries. Israel said that the bomb was in the runnel visited by Yaalon, and that it could have exploded at any given moment, but it exploded the next day, and that the army started a classified investigation into the issue. The Qassam Brigades, Hamas's armed wing, declared the detection of part of a spy system used by Israel against resistance in Gaza, particularly east Khan Younis southern Gaza Strip. Abu Obeida, spokesman for the Brigades, announced in a press conference on Friday night that the Qassam Brigades recently managed to detect an important part of the spy system used by Israel against the Palestinians and the resistance in the Gaza Strip. The Qassam members taught the Israeli enemy a lesson it will not forget in Khan Younis city by revealing the Israeli plot against Gaza, he said. He pointed out that the armed wing is in the midst of continuous undeclared war with the Israeli enemy, adding that this war does not stop because of the continuous aggression against Palestinians. He stated that Israeli occupation forces tried on Thursday evening to infiltrate into Gaza Strip mounting eight bulldozers and three tanks. 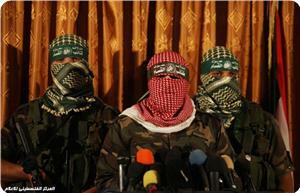 However the Qassam Brigades ambushed the soldiers, killing and injuring some of them, he added. “The enemy was paralyzed in front of a brave group of the Qassam Brigades”, Abu Obeida said, promising the Palestinian people to continue along the resistance path. Abu Obeida said that four of the Brigades' members were martyred during the attack, identified as Khaled Abu Bakra, Mohamed Rashid Daoud, Mohamed Essam Al Qassas, and Rabe'a Abu Baraka. Any Israeli incursion or aggression on our land or our people, will not pass without high price, he vowed, stressing that Gaza will continue to be as always a graveyard for the invaders. In the midst of the battle with the enemy, we will not forget the key issues of our nation especially Jerusalem, Al-Aqsa mosque, the prisoners and settlements, the spokesman continued. “The Qassam Brigades will not accept our people to be starved or live in the dark”, the spokesman said, warning of unprecedented waves of fury if the blockade remained in force on Gaza. The Qassam Brigades had declared that four of its fighters have been killed while blocking an Israeli incursion east of Khan Younis in the southern Gaza Strip. The Israeli authorities also admitted the injury of five Israeli soldiers during the clashes. Meanwhile, Israeli military sources said that there is no radical solution to Gaza tunnels extending to the occupied territories in 48. He pointed out that the last violent clashes in Khan Younis proved the seriousness of Gaza tunnels. 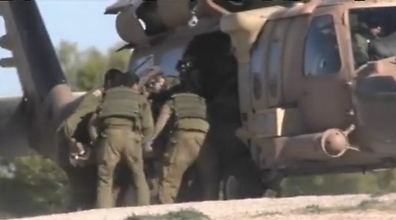 The Israeli 10th Channel said that one of the Israeli injured soldiers during the clashes is a unit's commander.